Received August 10, 2018; Revised October 4, 2018; Accepted October 29, 2018. Percentage of aerenchyma area has been closely linked with amounts of methane emitted by rice. 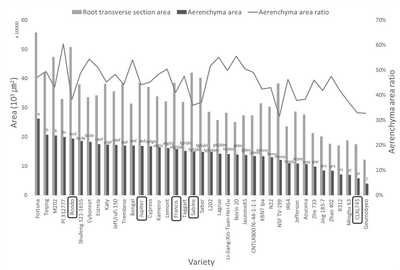 A diversity panel of 39 global rice varieties were examined to determine genetic variation for root transverse section (RTS), aerenchyma area, and % aerenchyma. RTS and aerenchyma area showed a strong positive correlation while there existed no significant correlation between RTS area and % aerenchyma. Five varieties previously shown to differ in methane emissions under field conditions were found to encompass the variation found in the diversity panel for RTS and aerenchyma area. 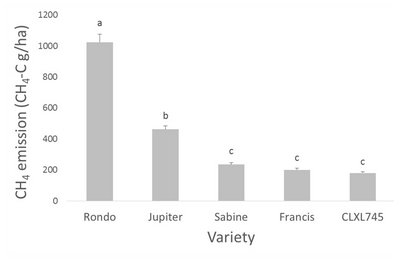 These five varieties were evaluated in a greenhouse study to determine the relationship of RTS, aerenchyma area, and % aerenchyma with methane emissions. Methane emissions at physiological maturity were the highest for ‘Rondo’, followed by ‘Jupiter’, while ‘Sabine’, ‘Francis’ and ‘CLXL745’ emitted the least. The same varietal rank, ‘Rondo’ being the largest and ‘CLXL745’ the smallest, was observed with RTS and aerenchyma areas. RTS and aerenchyma area were significantly correlated with methane emissions, r = 0.61 and r = 0.57, respectively (P < 0.001); however, there was no relationship with % aerenchyma. Our results demonstrated that varieties with a larger root area also developed a larger aerenchyma area, which serves as a gas conduit, and as a result, methane emissions were increased. This study suggests that root transverse section area could be used as a means of selecting germplasm with reduced CH4 emissions. Methane (CH4) is one of the main greenhouse gases and is known to be a major cause of global warming. The temperature of the Korean peninsula has been reported to have risen by 1.7°C over the past 100 years. This is more than twice the average rise in global temperature (NIER 2010). Korea, therefore, has established a national greenhouse gas comprehensive management system and generated greenhouse gas low emission plans (GIR, Greenhouse Gas Inventory & Research Center of Korea, www.gir.go.kr). The second most abundant greenhouse gas, methane, is ~25 times more potent in global warming potential than carbon dioxide, and 7–17% of atmospheric methane comes from flooded rice fields (IEA 2015). More than 90% of methane generated in the rice paddy is released into the atmosphere through plant aerenchyma, with global rice production estimated to produce 20 to 150 Tg of methane per year (Cicerone and Oremland 1988; Conrad 1993; Neue and Sass 1994; Sass 1994; IPCC 2006). Rice cultivation areas continue to expand with population growth and methane emissions are expected to increase accordingly (Wang et al. 2000). Therefore, the development of technologies to reduce methane from rice paddies is a key area of research that can minimize the contribution of rice production to global warming (Rennenberg et al. 1992). Methane is produced by anaerobic soil bacteria, methanogens and methanotrophs, by utilizing organic matter from the soil and rice root exudates, and it is transported to the atmosphere through aerenchyma (Butterbach-Bahl et al. 1997; Aulakh et al. 2000; Kerdchoechuen 2005; Win et al. 2012). Furthermore, it has been shown that genetic variation exists in methane emissions (McClung et al. 2012; Gutierrez at al. 2013; Simmonds et al. 2015; Jiang et al. 2017). Previous studies have shown that there is a correlation between methane emissions of rice varieties and height, panicle number, tiller number, shoot biomass, yield, root biomass, and/or aerenchyma (Sass et al. 1990; Neue and Roger 1993; Sinha 1995; Ali et al. 2008). In contrast, Gutierrez et al. (2013) showed there was no correlation between methane emissions and agricultural traits, but instead, there existed positive and negative correlations between methanogenic and methanotrophic bacteria, respectively, with methane emissions and suggested that differences at the root soil interface may be important in methane emissions in rice. Methanogenic and methanotrophic bacteria affect the methane cycle in soil by producing and oxidizing methane, respectively. In particular, methane emissions are also affected by soil microbial activity and composition. The transport of methane and oxygen through the aerenchyma plays a role in supplying substrate to methanogenic bacteria and methanotrophs through root exudates (Butterbach-Bahl et al. 1997; Aulakh et al. 2000; Bodelier et al. 2000; Kerdchoechuen 2005). Rice has well-developed aerenchyma providing oxygen supply to the roots as a means to adapt to growth under flooded, anaerobic conditions (Armstrong 1978; Grosse and Schröder 1985). The extent of aerenchyma differences among rice varieties, which affects methane transport capacity, may explain differences in methane emissions (Butterbach-Bahl et al. 1997). In general, the gas transport capacity of rice increases from the seedling stage to heading and decreases from heading to maturity (Gutierrez et al. 2013). It is known that root permeability and gas transport capacity are reduced and emissions are lowered in the rhizosphere due to methane oxidation (Nouchi et al. 1994; Aulakh et al. 2002; Wassmann et al. 2002). The underlying mechanisms explaining differences in methane emissions among rice varieties are not clear. A previous study suggested breeding high yielding rice cultivars with reduced CH4 transport capacity (Aulakh et al. 2001) as a means of developing a low CH4-emitting rice cultivar. We conducted studies to determine genetic variability for aerenchyma in a globally diverse panel of 39 varieties grown under flooded field conditions and to ascertain the relationship between methane emissions from the soil and the area of root aerenchyma at physiological maturity among five selected cultivars known to differ in seasonal methane emissions (McClung et al. 2012; Simmonds et al. 2015). We found that there was a strong positive correlation between root transverse section (RTS) area and methane emissions as well as with aerenchyma area. However, our study demonstrated that % aerenchyma is not a major trait affecting methane emissions. A field study was conducted in 2016 at the Dale Bumpers National Rice Research Center (DBNRRC, Stuttgart, AR, USA) to evaluate a rice global diversity panel consisting of varieties. The soil at the location is classified as a Dewitt silt loam (fine, smectitic, thermic, Typic Albaqualfs) soil, and was pre-treated with P and K fertilizer (29 and 84 kg P and K/ha, respectively). Prior to planting 56 kg phosphorus/ha, 101 kg potassium/ha, and 11 kg zinc/ha were applied and incorporated. The study was planted in a randomized complete-block design having three replications. Plots were drill seeded on June 6, 2016 as hill plots with individual plants on a 0.09 m2 grid. Plots emerged on June 17 and, on July 7, were fertilized with 56 kg N/ha prior to establishing permanent flood on the following day. When all varieties had matured, the field was drained and left to dry. The root balls of two isolated plants for each genotype were dug up (see below). Four rice varieties (‘Rondo’ [PI 657830], ‘Jupiter’ [PI 639742], ‘Francis’ [PI 632447], ‘Sabine’ [PI 636466], and, one hybrid, ‘CLXL745’ [RiceTec, Inc. Alvin, TX]), previously determined to differ in seasonal methane emissions in field studies (McClung et al. 2012; Simmonds et al. 2015), were evaluated in a greenhouse study during May to September, 2017. The experiments were carried out with three replications in flooded water basins using a randomized complete block design. The average air temperature was 23.5 ± 0.25°C, and the total PAR fluxes were 2180.9 mmol/m2. The soil type was the same as used in field studies, and was pre-treated with P and K fertilizer (29 and 84 kg P and K/ha, respectively). Seedlings were grown for up to 21 days and one plant was transplanted into a polyvinyl chloride (PVC) pipe (23 cm diameter × 30 cm height), and the N fertilizer (144 kg urea-N/ha) was applied just prior to the initial flooding, a week after transplanting. The flood depth was maintained at 5–7 cm, and agronomic traits such as plant height and tiller number were measured (Table 1). All varieties were harvested when panicles were fully ripened. Rondo and Jupiter, Sabine and Francis and CLXL745 were harvested at 128 days, 106 days and 93 days after sowing, respectively. From the 2016 field study, roots of 36 varieties were collected after all panicles were ripened and seed had been harvested. Root masses from two isolated plants per plot were dug up, the soil around the root ball was carefully removed, and the roots were thoroughly washed. Below-ground region of 100 mm below root base was cut, and immediately fixed with 70% methane solution in a 50-mL falcon tube, and then stored in at 4°C until ready for analysis. RTS were made with a fine blade in distilled deionized water, and examined for optical microscopic analysis. In the greenhouse, to minimize time difference between methane emissions and root aerenchyma analysis of each variety (Rondo, Jupiter, Francis, Sabine, and CLXL745), root sampling was performed immediately after gas sampling. The root sampling method was the same as that performed in the field. Root observation was performed using a microscope equipped with a digital camera (Olympus BX50F with a Diagnostic Instruments RTKE 7.4 Slider with 10× magnification). Ten images of 100× per sample were used for area analysis of aerenchyma area ratio and all sample images had high resolution images of 1,200 dpi. Image analysis was performed using ‘ImageJ’ program (Rueden et al. 2017). Root tissues that have aerenchyma have a bright pixel value (RGB value) whereas tissues without aerenchyma will have relatively dark pixel value (Fig. 1). The histogram option of ‘ImageJ’ was used to distinguish between aerenchyma and non-aerenchyma containing pixel areas. The lowest threshold limit size of pixel was set at 1 × 103 μm2 in order to obtain aerenchyma area. Aerenchyma area and RTS area presented in this experiment represent the number of pixels in their respective color categories. Percentage (%) of aerenchyma was determined as the ratio of aerenchyma area:root transverse section area. Methane emissions were determined based on the protocol for field measurement of greenhouse gas fluxes in lowland rice (Agroecosystems Laboratory, Department of Plant Sciences, University of California – Davis, Adviento-Borbe et al. 2013 and 2015). A PVC pipe chamber, 23 cm diameter and 30 cm in height, was used in each pot. To measure methane efflux, we used 15-, 30-, and 60 cm pipe extensions depending on the height of the plant at measurement time. To connect each pipe, a band of rubber (20 cm) was used to prevent any inflow air from outside. The chamber lid was 7.5 cm height, one side sealed with silicone, and wrapped with an insulating foil to reduce thermal effects. Four holes were drilled into the lid and used for gas sampling, thermometer, and circulation fan. Methane samplings were collected at physiological maturity (R9) and the day before root harvest (see above). Gas (25 mL) was sampled four times at 20-minute intervals (0, 20, 40, and 60 minutes) within an hour after sealing the chamber lid of each pipe between 10:00 am and 13:00 pm, and collected in a pre-evacuated 12-mL glass vial (Labco Ltd.) double-sealed with rubber septa and silicon. The ambient air was collected in the same way and used as a control sample. A GC 2014 gas chromatograph (GC) (Shimadzu Scientific) with flame ionization detector set at 250°C was used to measure CH4 emissions. A column packed with Hayesep D, 80/100 mesh at 75°C separated CH4, and a 1 mL headspace gas using an autosampler (Bandolero, XYZTEK) was injected into the GC inlet port. Analysis of variance (ANOVA) and t-tests were conducted using the ‘R’ (R core team 2018, ver. 3.4.1) and Microsoft Excel (ver. 2013) programs. Duncan’s Multi Range Test (DMRT) test and t-test were conducted at the P < 0.05 level of probability. A total of 39 varieties (36 in the field study and three additional varieties from the greenhouse study) were examined to determine genetic differences in the RTS area, the aerenchyma area and their ratio (converted to percent) (Fig. 2). Varieties differed significantly for all root traits (P < 0.05). ‘Fortuna’ had significantly greater aerenchyma area than all other varieties. This was followed by Rondo which had significantly greater aerenchyma area than the other varieties included in the 2017 greenhouse study. The variety with the smallest aerenchyma area was ‘Geumobyeo’ which was not significantly different from CLXL745 that was also used in the methane study. When compared to all 39 varieties, Jupiter, Francis, and Sabine did not differ significantly from each other for aerenchyma area. Although Fortuna had the greatest RTS and aerenchyma area, the % aerenchyma was greatest for PI 312777 with more than 60% indicating that it has greater aerenchyma formation efficiency (Fig. 2). In fact, five varieties used in the methane study had relatively low (< 45%) % aerenchyma compared to the larger genetic panel. This was largely due to these varieties having some of the largest RTS. The exception to this was CLXL745 which also had one of the lowest RTS and % aerenchyma values. This survey of a global diversity panel demonstrates that there are varieties with greater genetic differences for root traits that may be worth evaluating for methane emissions. To determine the relationship between methane emissions and % aerenchyma, CH4 emissions were collected at physiological maturity (R9 stage) and root samples were collected the day after gas sampling. The CH4 efflux values showed significant differences among the varieties (Fig. 3). Rondo had the highest methane emissions, followed by Jupiter, while Sabine, Francis and CLXL745 were the lowest (P < 0.05) (Fig. 3). Both Rondo and Jupiter, had the longest growth period of 128 days to harvest, followed by Sabine and Francis with 106 days to harvest. CLXL745, which had the shortest growth period of 93 days (Table 1), showed the lowest methane emissions (Fig. 3). To compare methane emissions with root traits of the five selected varieties, roots were sampled immediately after gas measurements. The area of RTS was the largest in Rondo, Sabine, and Francis, followed by Jupiter, and with CLXL745 being the smallest (P < 0.05) (Fig. 4). A similar ranking was observed for aerenchyma area (Fig. 4). The % aerenchyma was the highest in Jupiter, followed by Francis, Rondo, and Sabine, with CLXL745 having the smallest (Fig. 5). RTS area and aerenchyma area were both positively correlated with methane emission, r = 0.61 (P = 0.0046) and r = 0.57 (P = 0.0081), respectively (Fig. 6). On the other hand, there was no significant correlation between % aerenchyma and the CH4 emissions (r = 0.16, P = 0.51) (Fig. 6). Rondo, which had the highest methane emissions, had the largest number of tillers (average 28) among the five rice varieties (Table 1) and had one of the highest values for RTS area and aerenchyma area (Fig. 4). CLXL745 had an intermediate number of 18 tillers, similar to Jupiter (Table 1), but it had the lowest methane emissions, aerenchyma area and % aerenchyma (Fig. 4 and 5). Jupiter which had the second highest methane emissions, had aerenchyma area and % aerenchyma not significantly different from Rondo (Figs. 4 and 5), but fewer tillers (Table 1). Sabine and Francis did not differ significantly for methane emissions, aerenchyma area or % aerenchyma (Figs. 4 and 5), but Sabine had significantly more tillers than Francis (Table 1). 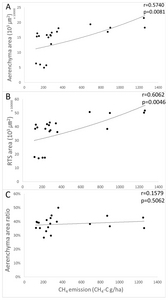 The RTS area and aerenchyma area showed a strong positive correlation with r = 0.89 (P < 0.001) (Fig. 7A). The aerenchyma area and % aerenchyma showed a positive correlation of r = 0.49 (P = 0.0015) (Fig. 7B), however, there was no significant correlation between the RTS area and the % aerenchyma (Fig. 7C). Since 60–90% of the total CH4 produced in rice fields is emitted through the rice plant versus through ebullition from the soil, selection of rice varieties has the potential for greatly influencing methane emissions (Liou et al. 2003). There have been many reports on controlling factors affecting methane emissions such as plant traits, soil traits, and aerenchyma. Among agronomic traits, above-ground biomass is known to have a strong positive correlation with methane emissions (Sass et al. 1991; Huang et al. 1997). However, recent studies have shown that the increase in the above-ground biomass attributes to the production photosynthate, some of which is remobilized to the roots, and used as a substrate for the growth of methanogenic bacteria (Gutierrez et al. 2013). Thus, selection for biomass itself may be counterproductive towards efforts to control methane emissions. Aerenchyma has been also considered to be one of the key factors in methane emissions. Aerenchyma is well developed in root, internodal, leaf sheath, and leaf organs (Matsukura et al. 2000; Colmer and Pedersen 2008; Steffens et al. 2011). As the plant grows, the primary roots develop branched secondary roots, which in turn develop tertiary roots. Young roots have cortical cells, and as they grow, the cortical cells degenerate and develop into aerenchyma when subjected to flooded anaerobic conditions, indicating that aerenchyma development occurs at a very early growth stage (Aulakh et al. 1999). In mature roots, very large aerenchyma have developed and dominate the root structure (Fig. 3, Aulakh et al. 1999). The aerenchyma throughout the plant delivers atmospheric oxygen to roots, and inversely, gas in the soil-root zone is emitted through the aerenchyma to the atmosphere. Bi-directional gas exchange between roots and the atmosphere through the aerenchyma has long been studied (Cicerone and Shetter 1981; Higudchi 1982; Higudchi et al. 1984; Mosier et al. 1990; Prade and Trolldenier 1990; Nouchi and Mariko 1993; Aulakh et al. 1999; Wassmann et al. 1996; Wang et al. 1997; Colmer 2003). In this methane emissions experiment, the amount of methane emissions was different according to the maturation period of the cultivars. This result was different from those reported by Gutierrez et al. (2013) where there was no significant difference between early-maturing and middle-maturing rice varieties that had the same yield potential. Gutierrez et al. (2013) concluded that there is no difference in the amount of methane emitted among different varieties during the entire growing season due to the very small amount of methane emitted during the maturation period. However, this study showed that differences in cultivation time and flooding period due to length of variety maturity may affect the amount of methane captured in the soil under the flooded conditions. The number of roots produced is generally in proportion to the number of tillers (Kawata et al. 1959; Iwatsuki 1982; Yoshida et al. 1982). In the early growth stage, the number of roots increases more gradually than the tiller numbers, but it increases in the same manner by about 20 days after tillering (Yoshida et al. 1982). Rondo, which had the highest methane emissions, had the largest number of tillers (28) among five rice varieties (Table 1) and the greatest aerenchyma area and RTS area (Fig. 4). As with the RTS area and the aerenchyma area of five rice varieties (Rondo, Jupiter, Francis, Sabine, and CLXL745) (Fig. 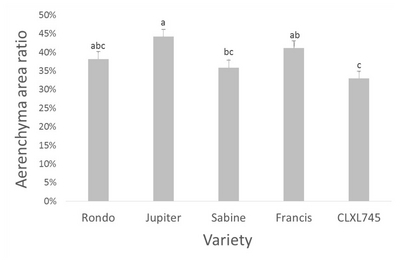 4), the lowest % aerenchyma was CLXL745, and % aerenchyma was not significantly different between Jupiter and Rondo (Fig. 5). However, our results show that the % aerenchyma area has no relationship with methane emissions, whereas the size of the roots and thus the amount of aerenchyma are related to methane emissions. In the experiment in which roots of 39 varieties were analyzed, RTS area and aerenchyma area were strongly correlated with r = 0.89 (P < 0.001). The larger diameter roots may have more potential to develop aerenchyma indicating potential increase in gas transport capacity. As a result, the RTS area could be used as an index for selection of low CH4-emitter rice varieties. There are complicated interactions of plant-soil-microbe in the rhizosphere, wherein methane is produced and emitted into atmosphere, and aerenchyma is the conduit for gas exchange. It is clear that the aerenchyma system does affect methane emissions; however, this study demonstrated that % aerenchyma itself is not a major trait affecting methane emissions. We speculate that if the difference in % aerenchyma is significantly large, then we might have seen a strong positive correlation with methane emissions. Although the varieties that were used in the methane analysis showed significant differences in RTS and aerenchyma area and comparable to the breadth of differences found in the diversity panel, they showed less divergence for % aerenchyma as compared to other global rice varieties. Thus, if the difference in % aerenchyma is relatively small, other plant traits could more important for methane emissions. Future studies could be conducted using rice varieties with high and low extremes in % aerenchyma to further confirm the relationship between % aerenchyma and CH4 emissions in order to develop improved germplasm with reduced methane emissions. This study was carried out with the support of the Cooperative Research Program of Rural Development Administration, Republic of Korea and United State Department of Agriculture, Agricultural Research Service, US (Project title: Development of a screening methodology for assisting in rice cultivar selection for reduced methane emissions, Project No. : PJ012431). The authors acknowledge Jonathan Moser, Jason Gaspar, Laduska Sells, Tim Scott, Courtland Hemphill, and Aaron Jackson for collecting the field data, and tissue samples. USDA is an equal opportunity provider and employer. Fig. 1. Transverse section of a representative mature root of five rice varieties. Ep: epidermis, Ar: aerenchyma, Ct: Cortical cells, St: Stele (vascular bundle). Fig. 2. Rank-order list of 39 varieties by aerenchyma area and including root transverse section area and aerenchyma area ratio. Varieties shown in bold line box were from the 2017 greenhouse methane study and all others were from the 2016 field study. The same letters indicate no significance at the 0.05 probability level by Duncan’s multiple range test. Fig. 3. Average CH4 emissions of five rice varieties. The same letters indicate no significance with 5% probability by Duncan’s multiple range test. After transplanting, methane sample was collected at 127 days for ‘Rondo’ and ‘Jupiter’, 105 days for ‘Sabine’ and ‘Francis’, and 92 days for ‘CLXL745’. Fig. 4. 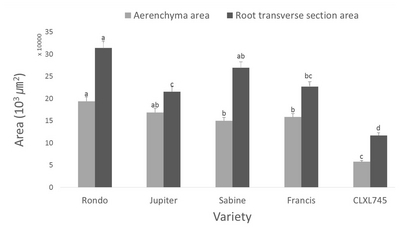 Comparison of aerenchyma area and root transverse section area of five rice varieties. The same letters indicate no significance at the 0.05 probability level by Duncan’s multiple range test. Fig. 5. Comparison of aerenchyma area ratio of five rice varieties. The same letters indicate no significance at the 0.05 probability level by Duncan’s multiple range test. Fig. 6. Correlation between CH4 emissions and aerenchyma area (A), root transverse section area (RTS) (B), and aerenchyma area ratio (C) of root cross sections of five rice varieties. Fig. 7. 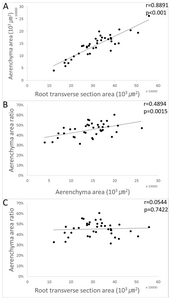 Correlation between root transverse section area and aerenchyma area (A), aerenchyma area and aerenchyma area ratio (B), and root transverse section area and aerenchyma area ratio (C) of root cross section of five rice varieties. Comparison of four varieties and one hybrid line for agronomic traits from the 2017 greenhouse study. L: Long grain, M: Medium grain. Days from sowing to harvest. Values in columns followed by the same letters are not significantly different using Duncan’s multiple range test (P < 0.05). Adviento-Borbe, MA, Necita Padilla, G, Pittelkow, CM, Simmonds, M, van Kessel, C, and Linquist, B (2015). Methane and nitrous oxide emissions from flooded rice systems following the End-of-Season Drain. J Environ Qual. 44, 1071-1079. Adviento-Borbe, MA, Pittelkow, CM, Anders, M, van Kessel, C, Hill, JE, and McClung, AM (2013). Optimal fertilizer nitrogen rates and yield-scaled global warming potential in drill seeded rice. J Environ Qual. 42, 1623-1634. Ali, MA, Lee, CH, and Kim, PJ (2008). Effects of silicate fertilizer on reducing methane emission during rice cultivation. Biol Fertil Soils. 44, 597-604. Aulakh, MS, Bodenmender, J, Wassmann, R, and Rennenberg, H (2000). Methane transport capacity of rice plants. Part II. Variations among different rice cultivars and relationship with morphological characteristics. Nutrient Cycling in Agroecosystems. 58, 367-375. Aulakh, MS, Wassmann, R, and Rennenberg, H (2001). Methane emissions from rice fields -quantification, mechanisms, role of management, and mitigation options. Advances in Agronomy. 70, 193-260. Aulakh, MS, Wassmann, R, and Rennenberg, H (2002). Methane transport capacity of twenty-two rice cultivars from five major Asian rice-growing countries. Agric Ecosyst Environ. 91, 59-71. Aulakh, MS, Wassmann, R, Rennenberg, H, and Fink, S (1999). Pattern and amount of aerenchyma relate to variable methane transport capacity of different rice cultivars. Plant Biol. 2, 182-194. Bodelier, PL, Roslev, P, Henckel, T, and Frenzel, P (2000). Stimulation by ammonium-based fertilizers of methane oxidation in soil around roots. Nature. 403, 421-424. Butterbach-Bahl, K, Papen, H, and Rennenberg, H (1997). Impact of gas transport through rice cultivars on methane emission from rice paddy fields. Plant Cell Environ. 20, 1175-1183. Cicerone, RJ, and Shetter, JD (1981). Sources of atmospheric methane: measurements in rice paddies and a discussion. J Geophys Res Oceans. 86, 7203-7209. Cicerone, RJ, and Oremland, RS (1988). Biogeochemical aspects of atmospheric methane. Global Biogeochem Cycles. 2, 299-327. Colmer, TD (2003). Long-distance transport of gases in plants: a perspective on internal aeration and radial oxygen loss from roots. Plant Cell Environ. 26, 17-36. Colmer, TD, and Pedersen, O (2008). Oxygen dynamics in submerged rice (Oryza sativa). New Phytol. 178, 326-334. Grosse, W, and Schröder, P (1985). Aeration of the roots and chloroplast-free tissues of trees. Ber Deutsch Bot Ges Bd. 98, 311-318. Gutierrez, J, Kim, SY, and Kim, PJ (2013). Effect of rice cultivar on CH4 emissions and productivity in Korean paddy soil. Field Crops Res. 146, 16-24. Higudchi, T (1982). Gaseous CO2 transport through aerenchyma and intercellular spaces in relation to the uptake of CO2 by rice roots. Soil Sci Plant Nutr. 28, 491-497. Higudchi, T, Yoda, K, and Tensho, K (1984). Further evidence for gaseous CO2 transport in relation to root uptake of CO2 in rice plant. Soil Sci Plant Nutr. 30, 125-136. Huang, Y, Sass, R, and Fisher, F (1997). Methane emission from Texas rice paddy soils. II. Seasonal contribution of rice biomass production to CH4 emission. Glob Chang Biol. 3, 491-500. Iwatsuki, S (1982). Studies on paddy rice roots. Agric Hon (Toyo). 7, 64-70. Jiang, Y, van Groenigen, KJ, Huang, S, Hungate, BA, van Kessel, C, and Hu, S (2017). Higher yields and lower methane emissions with new rice cultivars. Glob Chang Biol. 23, 4728-4738. Kawata, S, and Ishihara, K (1959). Studies on the root hairs in rice plant. Proc Crop Sci Soc Jpn. 27, 341-348. Kerdchoechuen, O (2005). Methane emission in four rice varieties as related to sugars and organic acids of roots and root exudates and biomass yield. Agric Ecosyst Environ. 108, 155-163. Liou, RM, Huang, SN, and Lin, CW (2003). Methane emission from fields with differences in nitrogen fertilization and rice varieties in Taiwan paddy soils. Chemosphere. 50, 237-246. Matsukura, C, Kawai, M, Toyohuku, K, Barrero, RA, Uchimiya, H, and Yamaguchi, J (2000). Transverse vein differentiation associated with gas space formation - fate of the middle cell layer in leaf sheath development of rice. Ann Bot. 85, 19-27. McClung, AM, Anders, M, Adviento-Borbe, A, Bryant, RJ, Linquist, B, and Van Kessel, C 2012. Can southern US rice cultivars be used to mitigate greenhouse gas emissions? A preliminary study., Proceedings of the 34th Rice Technical Working Group Meeting, February 27–March 1, 2012, Hot Springs, Arkansas, pp.149. Mosier, AR, Mohanty, SK, Bhadrachalam, A, and Chakravorti, SP (1990). Evolution of dinitrogen and nitrous oxide from the soil to the atmosphere through rice plants. Biol Fertil Soils. 9, 61-67. Nouchi, I, Hosono, T, Aoki, K, and Minami, K (1994). Seasonal variation in methane flux from rice paddies associated with methane concentration in soil water, rice biomass, and temperature and its modelling. Plant Soil. 161, 195-208. Prade, K, and Trolldenier, G (1990). Denitrification in the rhizosphere of plants with inherently different aerenchyma formation: wheat (Triticum aestivum) and rice (Oryza sativa). Biol. Fertil. Soils. 9, 215-219. Rennenberg, H, Wassmann, R, Papen, H, and Seiler, W (1992). Trace gas exchange in rice cultivation. Ecological Bulletins No 42, 164-173. Rueden, CT, Schindelin, J, Hiner, MC, Dezonia, BE, Walter, AE, and Arena, ET (2017). ImageJ2: ImageJ for the next generation of scientific image data. BMC Bioinformatics. 18, 529. Sass, RL, Fisher, FM, Harcombe, PA, and Turner, FT (1990). Methane production and emission in a Texas rice field. Global Biogeochem Cycles. 4, 47-68. Sass, RL, Fisher, FM, Harcombe, PA, and Turner, FT (1991). Mitigation of methane emissions from rice fields: possible adverse effects of incorporated rice straw. Global Biogeochem Cycles. 5, 275-287. Sinha, SK (1995). Global methane emission from rice paddies: excellent methodology but poor extrapolation. Curr Sci. 68, 643-646. Simmonds, MB, Anders, M, Adviento-Borbe, MA, van Kessel, C, McClung, A, and Linquist, BA (2015). Seasonal methane and nitrous oxide emissions of several rice cultivars in direct-seeded systems. J Environ Qual. 44, 103-114. Steffens, B, Geske, T, and Sauter, M (2011). Aerenchyma formation in the rice stem and its promotion by H2O2. New Phytol. 190, 369-378. Wang, B, Neue, HU, and Samonte, HP (1997). Role of rice in mediating methane emission. Plant Soil. 189, 107-115. Wang, ZY, Xu, YC, Li, Z, Guo, YZ, Wassmann, R, and Neue, HU (2000). A four-year record of methane emissions from irrigated rice fields in the Beijing region of china. Nutrient Cycling in Agroecosystems. 58, 55-63. Wassmann, R, Aulakh, MS, Lantin, RS, Rennenberg, H, and Aduna, JB (2002). Methane emission patterns for rice fields planted to several cultivars for nine seasons. Nutrient Cycling in Agroecosystems. 64, 111-124. Wassmann, R, Neue, HU, Alberto, MC, Lantin, RS, Bueno, C, and Llenaresas, D (1996). Fluxes and pools of methane in wetland rice soils with varying organic inputs. Environ Monit Assess. 42, 163-173. Win, KT, Nonaka, R, Win, AT, Sasada, Y, Toyota, K, and Motobayashi, T (2012). Comparison of methanotrophic bacteria, methane oxidation activity, and methane emission in rice fields fertilized with anaerobically digested slurry between a fodder rice and a normal rice variety. Paddy and Water Environment. 10, 281-289.